Let's Play! Company 2018 Application | Flashback Theater Co.
Flashback Theater is now accepting applications for the 2018 Let’s Play! Company. The Let’s Play! Company is a group of theater artists dedicated to developing and growing together to strengthen our theater community. As a member of the Let’s Play! Company, you will be part of the core performance group at our monthly workshops. Company members are required to attend at least seven of the ten scheduled Second Saturday workshops in 2018. These members will have the opportunity to perform with each other on a regular basis over the course of the year, and will be responsible for creating an encouraging learning environment for new theater artists that attend Let’s Play! There will be opportunities to lead workshops, receive one-on-one artistic and professional guidance, and get a hands-on experience in improv and ensemble work. This year, company members will to choose to work on a project in one of the following theater disciplines: sets & lighting, playwriting, costuming, or administration. This opportunity will challenge company members to expand their knowledge of theater practice and open up new opportunities in the future. Company members will also get first choice to participate in special projects and events that come up throughout the year (such as the development of new work or one night only events). Six to eight members will be chosen for the company through the application process. Let’s Play! 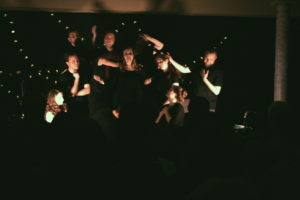 is intended to further the skills and techniques of our local theater artists while introducing the community to basic performing concepts through theater education and hands-on activity. Our company of actors makes Let’s Play! new and exciting each month. -Application Form, to be filled out via online application form or in person at our box office. -500 word (about 1 page) essay on your interest in the Let’s Play! Company. Talk about why you would be a good fit for the program and what you bring to the table individually as an artist. January 13th, 2018 at 7:00 p.m. | Flashback Theater at 400 E. Mount Vernon St.
Workshop Dates: The 2018 scheduled dates for Let’s Play! are: January 13th, February 10th, April 14th, June 9th, July 14th, August 11th, September 8th, October 13th, November 10th, and December 7th. Compensation: Company members will receive complimentary and discounted tickets and training throughout the year. Occasional stipends for special events. The application deadline is January 1st, 2018. Paper applications are also available for pickup at the FbTC Box Office. Paper applications can be returned to the box office with the appropriate accompanying materials. For questions, please email Let’s Play! Company Manager Alexandra George at alexandra@flashbacktheater.co, or call (888) 394-FbTC ext. 2.